Howick resident Katherine Yin Ping Chiu was worried that any mistake she made doing the poi dance on an international stage would be recorded on camera for the world to see. 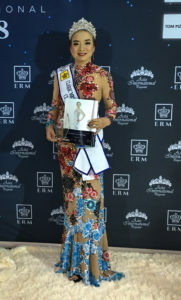 “I was so nervous to watch the video till I returned to Auckland from Thailand where the Mrs Asia International pageant was held last week. For the first time on an international stage, Katherine was one of the beauty pageant winners at the Mrs NZ Pageant held at SkyCity Convention Centre in May this year—where she won the title of 2018 Mrs NZ Ambassador and 2018 Mrs NZ Asian International Global. When the organisers Rose and Desmond Foulger who have hosted the Miss and Mrs New Zealand beauty pageants since the last 30 years, asked her if she was happy to represent NZ at the Mrs Asia International pageant to be hosted at Rayong, Thailand, she didn’t stress about it. She thought it was a good way to keep fit and workout as she prepares for the international beauty contest. 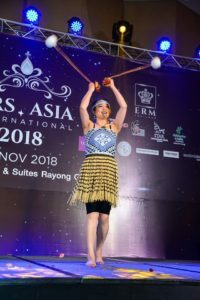 For the solo talent round Katherine decided that instead of singing or dancing she would learn the poi dance to showcase traditional New Zealand culture on the world stage. She soon got in touch with Taini Drummond, kuia and kaitiaki (trustee) for the Tainui Garden of Memories in Howick. Taini was absolutely delighted to have a new student at the poi classes held every Monday morning at the Garden of Memories. Poi is both a style of performing art and the equipment used for a poi performance. As a performance art, it involves swinging tethered weights through a variety of rhythmical and geometric patterns. While Katherine was absolutely enthused to learn the traditional Maori art form, she soon realised that it hurt badly. “It’s very hard, and not as easy as it looks,” she says talking about her experience of learning the art form. “The poi would hit my head and face and it would get red and swollen,” she admits. “While the poi is quite light, when it gains speed it hurts badly. I thought I should wear a helmet whilst practising it,” she laughs. However once on stage, she thankfully didn’t get the poi entwined and it all went well. Katherine even had her 20-year-old son studying at Auckland University, and who has won the Prime Minister’s scholarship, fly to Thailand for the grand finale to see his mum win the title of Classic Mrs Asia International Fitness Queen. Now that the beauty queen has returned home with a diamond studded crown, she is back to her regular day job. 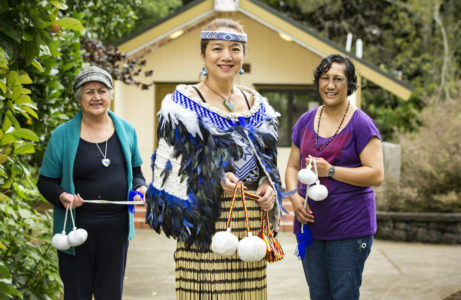 She says she is grateful to Taini for taking her in her fold and teaching her a traditional Maori art form which she could showcase to representatives from different countries.